Pear is an important temperate-climate fruit, cultivated since the beginnings of civilization. Due to the delicacy of its flavor, it is consumed by many different people, as fresh fruit or as a component of hot and cold dishes, as well as various drinks and as part of recipes handed down for generations. Due to its versatility and flavor, it has become an important commodity for several countries in Europe, and in China and the United States. Due to its broad dispersion around the world, major genetic breeding programs are necessary to obtain the best characteristics of market such as flavor, texture, color and odor, besides resistance to the most diverse types of pathogens found in the culture, like black spot, Dysaphis pyri , fire blight and scab; as well as adaptation to the various climatic and edaphic conditions in which the plant is cultivated. Another topic that needs attention within pear culture is the rootstock system, which influences cultivation around the world, contributing to the production of quality fruits. 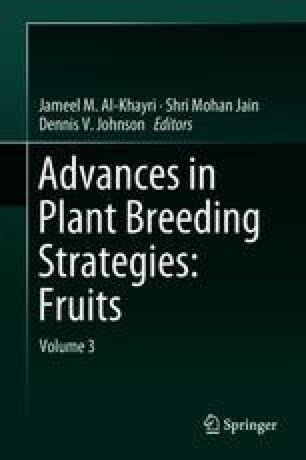 This chapter aims to provide an overview of the main topics related to pear genetic improvement programs around the world, as well as to update the literature on recent and innovative research studies mainly involving molecular markers and QTLs. Institut de Recherche en Horticulture et Semences. 147 rue de l’Université 75338 Paris. Better3fruit. Steenberg 36. B-3202 Rillaar, Belgium. European Fruit Research Institutes Network, Research Center for Fruit npo (pcfruit npo), Fruittuinweg 1, 3800 Sint-Truiden, Belgium. Prevar—Premium Apple and Pear products. Prevar Limited. 105 Eastbourne Street West. Hastings 4122—New Zealand. Harrow—Vineland—Vineland Research and Innovation Centre. 4890 Victoria Avenue N, Box 4000, Vineland Station, ON L0R 2E0 | 905.562.0320. Ontario, Canada. Plant and Food Research—Rangahau Ahumara Kai, 120 Mt Albert Road, Sandringham. Auckland 1025. New Zealand. Inova Fruit. Stationsweg 28 5301 KH Zaltbommel. The Netherlands. Empresa de Pesquisa Agropecuária e Extensão Rural de Santa Catarina—EPAGRI. Abílio Franco st, 1.500 C.P. 591 Zip: 89500-000 Caçador, SC, Brazil. Empresa Brasileira de Pesquisa Agrícola—EMBRAPA Uva e Vinho. Livramento st, nº 515 Caixa Postal: 130 CEP: 95701-008—Bento Gonçalves, RS, Brazil.